In the 1960s, a team of men from Gallaudet University in Washington, D.C., helped scientists study how space travel could affect the body. Each team member had lost his hearing in childhood in a way that affected his body’s ability to develop motion sickness. Pictured, some of the Gallaudet team prepare for a zero-gravity airplane flight. Motion sickness isn’t fun. When traveling in a car, airplane, or boat, it can start suddenly. At first you might feel queasy and start sweating. These sensations can then lead to stronger symptoms, such as dizziness, nausea, and vomiting. Ancient Greek sailors recognized the connection between sea travel and motion sickness. The English words nautical and nausea share the same Ancient Greek root word naus, meaning ship. The Ancient Greek word nausia meant ship-sickness. Today, we call motion sickness caused by boat travel seasickness. However, people can experience similar symptoms when traveling in airplanes or in cars. Motion sickness occurs when the body sends the brain conflicting messages. For example, when you read a text on your phone in a moving car, your brain receives two inputs. Since your eyes are focused on your phone’s screen and not the passing scene, the eyes tell the brain that nothing is moving. However, while your eyes don’t sense movement, your body does. When the brain receives different messages from the eyes and the body, a person may start to feel physically sick. The ear plays a key role in motion sickness. Along with hearing, the ear’s other role is to sense whether the body is balanced. The inner ear includes the body’s vestibular system. The vestibular system lets the body know if the head is moving side to side or up and down. 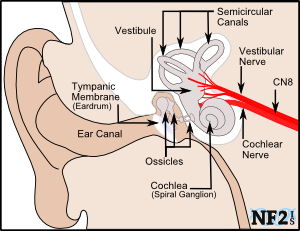 The ear’s vestibular system includes three fluid-filled canals. When your head moves from side to side or up and down, so does the fluid in these canals. Fluid in two small organs in your ear help detect when your head moves in a line, such as when you are walking or jumping up and down. The canals or organs all activate a nerve called the vestibular nerve. The vestibular nerve tells the nervous system how your head is moving. This information helps us control our eyes and bodies when we move our heads. For example, it is your vestibular systems that allows you to maintain focus on an object while moving your head from side to side. In 1957, the Soviet Union launched a satellite called Sputnik. Since the Soviet Union beat the United States into space, the U.S. quickly turned its attention to space travel. The newly formed National Aeronautics and Space Administration (NASA) was especially concerned about motion sickness. In space, the human body would feel weightless. In addition, while astronauts’ bodies might feel movement, their eyes might not detect it. These conflicting messages might make astronauts very sick. Without understanding motion sickness, people might not stay physically well enough to travel in space. In order to understand how bodies respond to motion, NASA needed two groups of people. One group included people who could get motion sickness, while the other group included people who could not. By comparing the reactions of each group, scientists hoped to learn more about motion sickness as a way to further space exploration. NASA scientists knew that the human ear played a large role in motion sickness. They needed to find a group of people whose vestibular systems were damaged, preventing them from becoming motion sick. NASA and the U.S. Naval School of Aviation Medicine contacted Gallaudet College (now called Gallaudet University). Gallaudet teaches students who have hearing impairments like deafness. NASA and the Navy wanted men who were physically fit, but men who could also withstand intense movement and gravitational forces. In addition, the subjects would need good writing skills so they could describe what they noticed and felt during the tests. With Gallaudet’s help, NASA was able to assemble a team of 11 men who were deaf and fit the criteria NASA needed for the tests. Most of the men lost their hearing in a specific way that affected their ability to feel motion sickness. All but one member of the team had contracted a disease in childhood called spinal meningitis. Spinal meningitis is an infection which affects the fluid and membranes around the brain and spinal cord. If patients do not receive immediate treatment in a hospital, their brains can quickly become damaged, and they can die within hours. Along with affecting hearing, spinal meningitis can also damage the ear’s vestibular system. If the disease kills cells and nerves that compose the vestibular system, the brain cannot receive information about balance or motion. With damaged vestibular systems, the 11 men on the team would not experience motion sickness. The one team member who did not have spinal meningitis felt motion sickness to only a small degree. “We were different in a way they needed,” said Harry Larson, one of the Gallaudet team members. The 11 men from Gallaudet helped test machines NASA would use to simulate space travel. Since none of them could develop motion sickness, the team could report on the physical effects of the simulators without becoming nauseous. In one test, four of the team members spent 12 straight days inside a a special room that spun 10 times each minute. While that spinning would make most people sick, none of the men from Gallaudet were bothered by it. As in a house, the rotating room had a stove, refrigerator, sink, toilet, shower, table, and chairs. It was also stocked with scientific equipment with which the subjects would conduct experiments. In order to test how spinning affected brain function, scientists had team members in the spinning room type sequences of letters or numbers on keypads or open locks with memorized codes. Scientists tested the team members’ physical dexterity by examining their ability to hold a stylus still inside a small opening without it touching the edges. Since the team could not get motion sickness, scientists could instead focus on the other ways that prolonged spinning affected the body. Another test might have seemed familiar to Ancient Greek sailors. Scientists placed a group of 20 people with healthy vestibular systems along with the team from Gallaudet on a wooden cargo ship off the Atlantic coast of Canada. Winds tossed the ship across the icy and turbulent waters. Scientists compared how each group reacted to the rough seas. While on board the ship, scientists collected data by studying subjects’ blood pressure, eye movement, and digestion. Eventually the tests had to stop—the scientists themselves became too sick to continue! 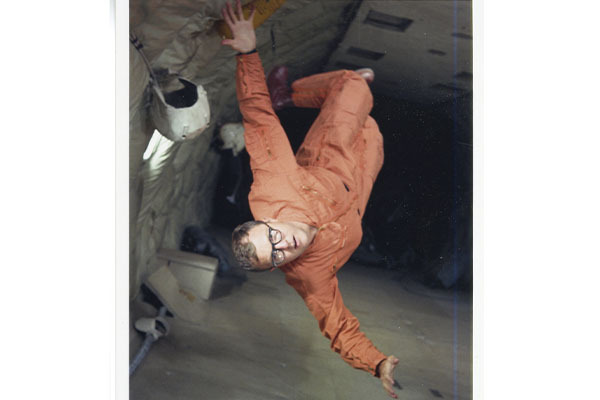 Gallaudet team member Donald Peterson prepares to be lowered into a centrifuge tank. Since team members could not get motion sickness, scientists could instead focus on their bodies’ other reactions to movement and gravity changes. The team from Gallaudet continued to participate in tests throughout the 1960s. With their help, NASA was able to learn a lot about how the body reacts to environments with gravity different from that on Earth. By learning more about motion sickness, the scientists could study how the human body adapts to spaceflight. Read more about how the team from Gallaudet College helped NASA scientists learn about motion sickness at Discover and NASA. Learn how the body can feel movement at Britannica and the American Speech-Language-Hearing Association. 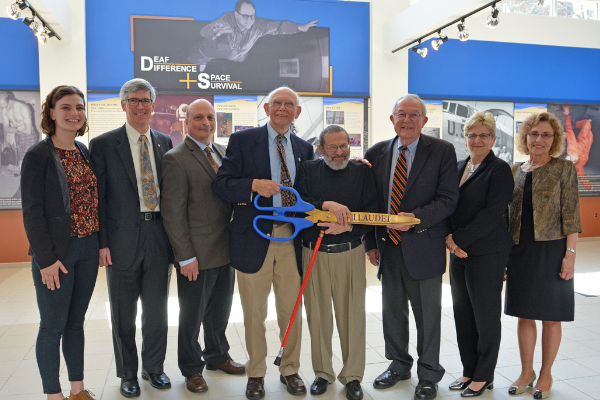 Discover how people who are deaf have contributed to history at WETA Radio and Virginia Commonwealth University.